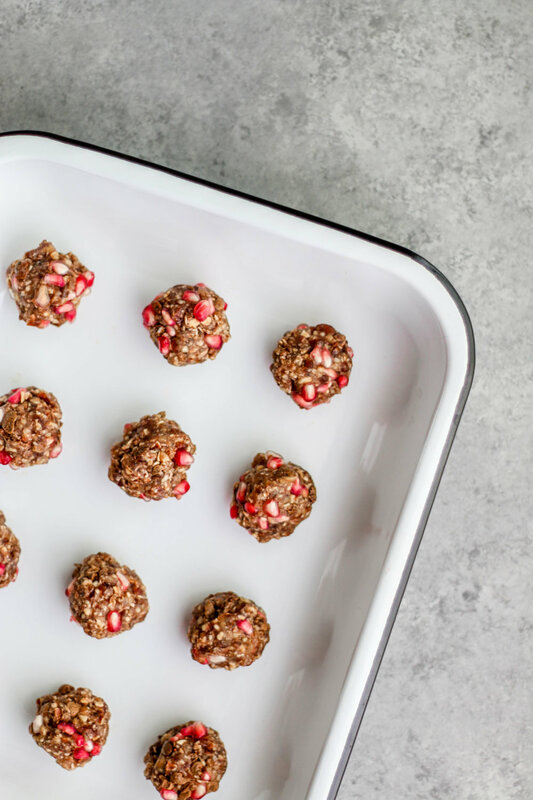 Easy pomegranate bliss balls that can be made in minutes. They are a great vegan snack for on the go or dessert. Pomegranate is a powerful antioxidant, dates are a great source of fiber, and pecans are filled with protein, magnesium, iron, and potassium. Add pecans and oats to food processor and turn on high for 10 - 20 seconds (until they are broken down into small bits). Add in dates and pomegranate juice and turn on high until contents are well-combined, forming a loose ‘dough’. Pour onto a pan and add pomegranate seeds. Form into small balls and place on pan. Store in fridge or freezer and enjoy when you like. If you are a fan of pomegranate check out this Pomegranate Smoothie Bowl. P.S. incase you’re curious this gorgeous white and black enamel pan is from Falcon Enamelware. If you’re loving this vegan bliss ball recipe let us know by commenting below. Also, remember to share with us on social by tagging @Raepublic and #Raepublic!